Acupuncture, by definition, is a system of complementary medicine that involves pricking the skin or tissues with needles, used to alleviate pain and to treat various physical, mental, and emotional conditions. 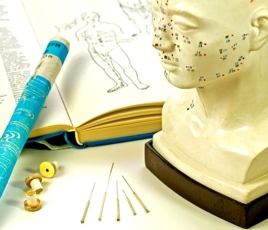 The earliest organized documentation about acupuncture was written in 100BC. Acupuncture is one of the oldest medical treatment technique that is still wildly using in modern time. Acupuncture physician use needles to activate certain points to promote the free flow of Qi (a life force) in order to achieve the balance of the body. Clinically, acupuncture physicians diagnose the cause and the nature of the condition according to the TCM theory. Then, making the appropriate acupuncture points prescription for treatment to promote the free flow of Qi (a life force) and blood in order to achieve the balance of the body’s Yin and Yang. Because in the TCM theory, the human body is considered as a whole, and patients are always treated based on the pattern (a collection of the symptoms of the condition) rather than one specific symptom. So, patients usually are not only experiencing the relieve of the current symptom, but also the improvement of the general health, such as increasing of energy level, better digestion, improved sleeping quality, etc. Acupuncture is recognized by the National Institute of Health (NIH) and the World Health Organization (WHO) to be effective in the treatment of a wide variety of medical problems. Click to find out what we treat.